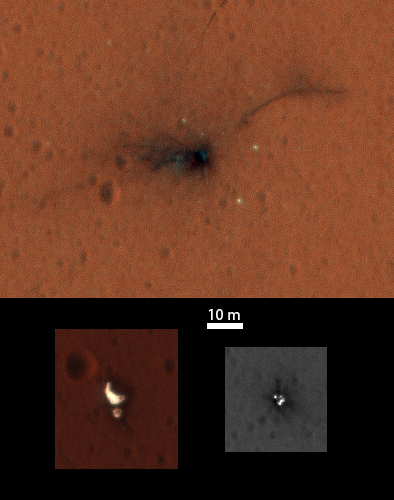 The ExoMars Schiaparelli lander or Entry, Descent, and landing Module (EDM) reached the Martian surface on 19 October 2016. Also on that day the Trace Gas Orbiter successfully entered Mars orbit. According to the ExoMars project, both the heat-shield and backshell-plus-parachute separated as planned, but the lander crashed at more than 83 meters per second (more than 300 kilometers per hour) velocity. This is the second HiRISE image of this location, capturing the EDM impact site and the backshell plus parachute in the color image area, plus another black and white image of the heat shield. The image cutouts are in raw image geometry rather than map-projected, and north is about 7 degrees to the right of straight up. At lower left is the backshell and parachute. The parachute is many times brighter than the Martian surface in this region. The smaller circular feature just south of the bright parachute is the backshell (2.4 meter-diameter). The parachute has a different shape than in the first HiRISE image, apparently shifting in the wind. We also observed this shifting of the Curiosity parachute while on the ground. At lower right are several bright features surrounded by dark radial impact patterns, located where the heat shield was expected to hit. The bright spots appear identical to the first HiRISE image, so it is bright material such as insulation layers, not specular reflections. At top are the markings left by the Schiaparelli module, now in color. From the first black and white image it was not clear if the relatively bright pixels or clusters of pixels scattered around the impact site were fragments of the lander or image noise. Now it is clear that at least the four brightest spots near the impact are not noise. These bright spots are in the same location in the two images and have a white color, unusual for this region of Mars. The module may have broken up at impact and some fragments might have been thrown outward like impact ejecta. This is a stereo pair with ESP_048041_1780.